Arrow recently brought out a dual-format edition of Luciano Ercoli’s paired thrillers, Death Walks in High Heels (1971) and Death Walks at Midnight (1972), both scripted by the ubiquitous Ernesto Gastaldi and starring Spanish actress Nieves Navarro (under her nom de screen Susan Scott), who happened to be Ercoli’s fiancee. Ercoli lacks the high profile of directors like Mario Bava, Dario Argento, Sergio Martino and Umberto Lenzi, partly because he wasn’t as much of a stylist as them; in fact, he was a producer who turned to directing in order to save on the budget, beginning with The Forbidden Photos of a Lady Above Suspicion (1970). Although Arrow, and commenter Tim Lucas, sell the Death diptych as gialli, for me they lack certain necessary elements, in particular the underlying twisted psychopathy behind the murders. With stories predicated respectively on a stash of stolen diamonds and drug smuggling, and a straightforward, less feverish visual style, these two films seem to fall more into the realm of classical mystery, although Gastaldi does pull some interesting narrative tricks. The new hi-def transfers are a step up from the 2005 DVD edition from the late, lamented No Shame (which also included a CD of selections from various Stelvio Cipriani soundtracks, though oddly not from these two films) and the new extras, including two typically informative and enthusiastic Tim Lucas commentaries, interviews with Gastaldi and Cipriani, and featurettes on the director and star, make the upgrade worthwhile. Massimo Dallamano’s What Have You Done to Solange? (1972) is a truer giallo, with a deep streak of nastiness and some odd convolutions in character and plot. Dallamano, a cinematographer whose career began in the ’40s, switched to directing in the late ’60s after shooting, among others, Sergio Leone’s first two westerns. Perhaps not surprisingly, Solange is very well shot (by Joe D’Amato, a cinematographer/director himself with hundreds of movies to his credit in both capacities). Like many thrillers of the period at least partially funded with German money, the credits try to link this one with the krimi by spuriously crediting the story to a novel by Edgar Wallace. Set in London for international appeal, the story takes place in a kind of alternate reality in which the physical and social geography bear little resemblance to the actual city. The narrative concerns a mysterious gloved figure who is killing girls at a Catholic boarding school. The “hero” Enrico Rosseni (Fabio Testi) is a teacher at the school who is involved in a relationship with one of the girls while trapped in an embittered marriage with another teacher, the German Herta (Karin Baal). The need to conceal this illicit affair (although almost everybody seems to know about it) ends up casting suspicion on Enrico. The bulk of the film involves him running a parallel investigation in order to clear himself, but the most interesting aspect deals with the way in which the murders and the crisis they precipitate actually end up healing and strengthening his marriage to Herta. The killings are nasty, but they’re given the same kind of psychological justification that we find in many gialli, rooted in a traumatic incident in the past. As is often the case, the solution is almost tossed off as if unimportant, though it’s interesting, given the title, that Solange (25-year-old Camille Keaton six years before starring in Meir Zarchi’s I Spit On Your Grave ) only turns up towards the end. Steeped in sin and guilt, the film would have been more appropriately set in Italy, but the faux English trappings give it a distinctive atmosphere which distinguishes it from some of the more routine gialli of the period. Arrow’s Blu-ray is an improvement over a fairly good 2005 region 2 DVD, the big selling point besides a new 2K transfer being all the extras (Arrow has proved pretty consistent with their commitment to enhancing their releases with multiple supplements), beginning with the enthusiastic commentary by Alan Jones and Kim Newman. There are also multiple interview featurettes and a video essay by Michael Mackenzie about this film and two semi-sequels. 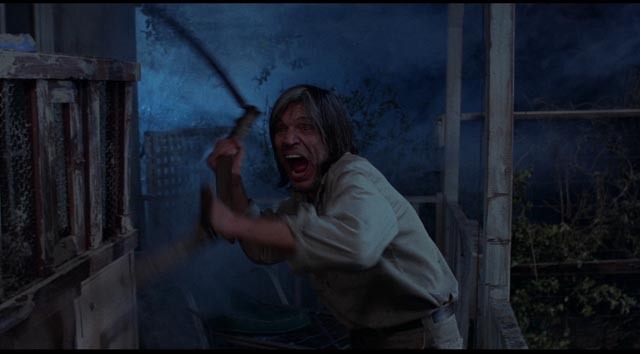 Arrow also have Blu-ray releases of Tobe Hooper’s often maligned Eaten Alive (1976), his follow-up to the success of Texas Chain Saw Massacre, and The Funhouse (1981). Both went against the grain of then current genre expectations and were either ignored or dismissed. They were also plagued like much of Hooper’s work with rumours of his being kicked off the projects before completion. Eaten Alive is the more interesting film, an entirely studio-bound production (even the exterior of the main hotel set, with its accompanying murky pool, was built on a soundstage) which is rooted in travelers-waylaid-by-crazy-backwoods-maniac tropes, weaving several threads around hotel-owner Judd (Neville Brand in a career-best performance), a deranged war vet plagued by what we’d now recognize as severe PTSD, who spends the movie muttering to himself in what seems to be an attempt to make sense of his own madness as he kills people with a large scythe and feeds them to his pet crocodile. 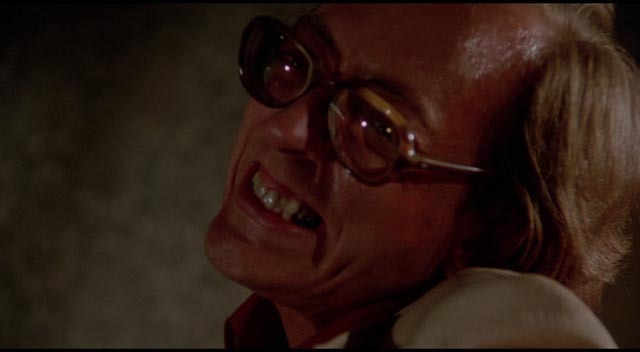 The cast features Robert Englund in his first role, the always interesting William Finlay, Marilyn Burns (star of Chain Saw), and perhaps most surprisingly Mel Ferrer and Carolyn Jones (the latter in an inexplicably bizarre thick pancake makeup which adds to the film’s aura of strangeness). The blend of madness, violence and off-kilter comedy make Eaten Alive one of Hooper’s most interesting films, signalling the source of what would be many conflicts to come – a sensibility which simply doesn’t align neatly with commercial expectations for low budget genre films. The Funhouse is in some ways one of his most disappointing films largely because it seems to strive to stay within its pre-ordained category, the slasher movie. This starts with an opening so blatantly lifted from Halloween and Psycho that it’s tempting to think that Hooper was giving the finger to the producers who hired him to make something formulaic. Because this sequence seems like an almost careless rip-off, it’s easy to miss the truly subversive undertone of incestuous desire and anger which sets up the theme driving the menace to come. That theme is rooted in the carnival community which stands in contrast to the ordinary middle class background of the teen characters who decide to spend the night in the titular sideshow attraction. Here they run afoul of monsters bred of that same incestuous desire, signaled by the pickled mutant foetus in the freak show and the disconcerting appearance of actor Kevin Conway in three different roles as various sideshow barkers; in-breeding among the carnies produces monsters, and yet on the periphery we see the kind of communal solidarity that Tod Browning depicted in Freaks (1932). Although the film’s monster is not clearly defined – he is treated fairly sympathetically at first before being relegated to a mere murderous boogeyman – the script (by Larry Block) frustrates slasher expectations by spending almost the first hour establishing and developing its characters before unleashing the violence. Hooper is striving for atmosphere and suspense, rather than a mechanical progression of kill sequences strung together by flimsy narrative. This tension between expectations and what is actually on screen hints at something more promising, a deconstruction of the genre, which never fully emerges. Although well-designed (by Morton Rabinowitz) and shot (by Andrew Laszlo), and with a group of kids who are a bit more sympathetic than the usual cardboard victims of the slasher, the film ends up being a bit like a freakshow mutant itself – not quite one thing or the other, but nonetheless interesting to look at for a moment. Both disks are packed with extras. Multiple featurettes dealing with effects and interviews with various people involved, both in front of and behind the camera. The commentary on Eaten Alive is by co-writer/producer Mardi Rustam, several actors, and make-up artist Craig Reardon; The Funhouse has no less than three separate commentaries, the one with Reardon being the most interesting; the one with producer Derek Power so dull I couldn’t get through it; and the one with Arrow regular Calum Waddell and slasher expert Justin Kerswell the most irritating. I think I’ve reached the point where I won’t bother to listen to a Waddell commentary again; his habit of off-handedly trashing other movies, often with no connection to the one at hand, as if the mere stating of his opinion is a definitive judgement, has an air of shallow fanboy arrogance which I find increasingly annoying; here, among other pronouncements, he slags off George Romero and asserts that Eli Roth is a genius and Hostel a masterpiece. I’ve just read a pair of books devoted to two features, one an old favourite, the other a film I’ve never quite warmed to, though I’ll now watch it again in light of what I’ve read. Sheldon Hall’s Zulu: With Some Guts Behind It (Revised Edition) (Tomahawk Press, 2014) is a massive, exhaustive (and occasionally exhausting) 500-page volume written by a film historian who is also a devoted fan of Cy Endfield’s 1964 epic. This is a revised and expanded edition of a book originally published in 2005, for which the author interviewed everyone he could possibly find who was connected with the production. His account of the making of Zulu draws in biographical information on all the principles, especially Endfield, co-producer/star Stanley Baker and writer John Prebble. He gives a detailed account of the state of the British film industry in the early ’60s and all the issues arising from shooting a big movie in the pariah state of South Africa where the filmmakers had to navigate all the complicated rules of apartheid which enforced discriminatory behaviour towards the Zulu extras and advisers whom the company had a great deal of respect for. Zulu is a great British adventure set in colonial times, but made in the era of colonial disintegration. Its subject is a minor, tangential military skirmish in 1879 in which a small unit of the British army had to defend itself at the mission station at Rorke’s Drift immediately after the Zulu army destroyed a British column at Isandhlwana. The danger faced by the filmmakers lay in seeming to valorize the “civilized” Europeans at the expense of the “savage” Africans and to some degree the film can’t avoid this, although Endfield and Prebble strove to supply some kind of balance by honouring the Zulus; but the focus is on the defenders and few of the Africans are given any individual presence (a problem which is still apparent today in such movies as Ridley Scott’s Black Hawk Down and Michael Bay’s 13 Hours). Which is not to say that Zulu is a thoughtless paean to past British glory; issues of class inevitably arise and by the end a sense of the enormous futility of the battle and its senseless destruction of life on both sides undercuts any temptation to see the soldiers’ survival as some kind of triumph. Hall weaves an account of the historical context through his detailed narrative of the grueling task of making the film under extremely difficult circumstances, evoking a renewed appreciation for what Endfield and Baker managed to accomplish. Somewhat to my surprise, I found Paul Seydor’s The Authentic Death and Contentious Afterlife of Pat Garrett & Billy the Kid (Northwestern University Press, 2015) even more interesting. I originally saw Sam Peckinpah’s final western during its brief theatrical run in 1973, catching up with it again in 2005 when it was released on DVD by Warners in two versions (one of the two preview cuts screened shortly before its release, and a new version assembled by Seydor himself by combining the theatrical cut with elements from the previews). While certain scenes stayed vividly with me, the film itself didn’t. Reading Seydor’s account of the making and undoing of the film definitely demands that I revisit it now. This book is unlike anything I’ve read before about the making of a movie, perhaps because it comes from the perspective of a film editor whose focus is finely tuned to matters of detail and structure. 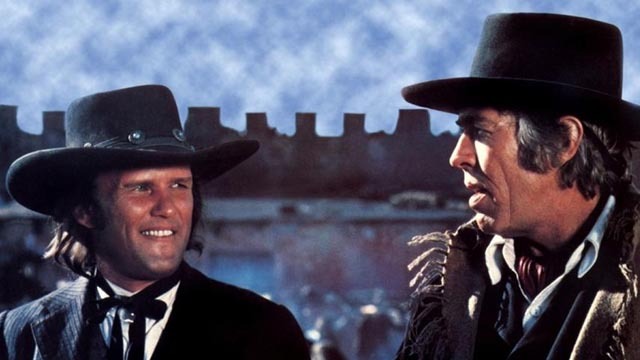 For almost two-hundred pages, Seydor provides a minutely detailed account of the origins and evolution of the film’s script, beginning with The Authentic Death of Hendry Jones, Charles Neider’s 1956 novel based on the story of Billy the Kid which was eventually transformed into Marlon Brando’s One-Eyed Jacks, a movie for which Peckinpah wrote the first version of the screenplay. Seydor dissects that book, Peckinpah’s adaptation, the contemporary account of the Kid’s life and death attributed to Pat Garrett (but largely ghost-written), Rudy Wurlitzer’s screenplay about the Kid originally written for director Monte Hellman, and finally the reworking of that script in collaboration with Peckinpah when he took over the project. Seydor, a huge admirer of Peckinpah, goes into sometimes painful detail about this final process, conducted under impossible time pressures and pronounced hostility from MGM studio head James Aubrey. That hostility, combined with his escalating alcoholism, provoked Peckinpah into increasingly self-destructive behaviour which prevented him from effectively solving many of the technical and dramatic problems of the script. On top of this, a fixed release date compressed post-production into less than three months, far too little time for a filmmaker like Peckinpah to find his film in the material shot, let alone try to solve those narrative problems in the editing room. In Seydor’s account, those problems aggravated Peckinpah’s self-destructive tendencies and, well aware that he wouldn’t be able to solve them, he abandoned the film to his editors (Roger Spottiswoode, Garth Craven and others) who did the best they could to make it as close to a Peckinpah film as possible. This book is one of the finest accounts of the creative process involved in filmmaking that I’ve read, detailing the endless micro and macro decisions that cumulatively result in the final work; it illuminates how organic a process it is and just how something which is shot through with flaws and missteps can nonetheless amount to a movie which transcends its weaknesses to express something profoundly moving. Perhaps most importantly, the book has made me want to go back and re-watch all of Peckinpah’s movies. This entry was posted in Commentary and tagged Arrow Video, Blu-Ray, Directors, Film Criticism, Film History, Giallo, Horror, Italian Film, Thrillers, Western. Bookmark the permalink.